Die Active bombed your library~ but Summer’s not dead! 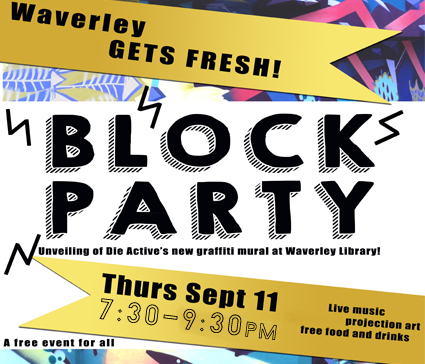 Run, board, or bike down to the Waverley Library at dusk and see us light up the walls with this special one time only performance of Video Projection Mapping! by PixelVoidVisuals. The streets will shut down & the art will come alive. Special musical performances by Solomon and Saskia Pateman, Free food from Lincoln Street Eatery and Sweet Escapes Cake Cafe & Bakery. Let Waverley and Die Active give you this one last sweet date with summer.